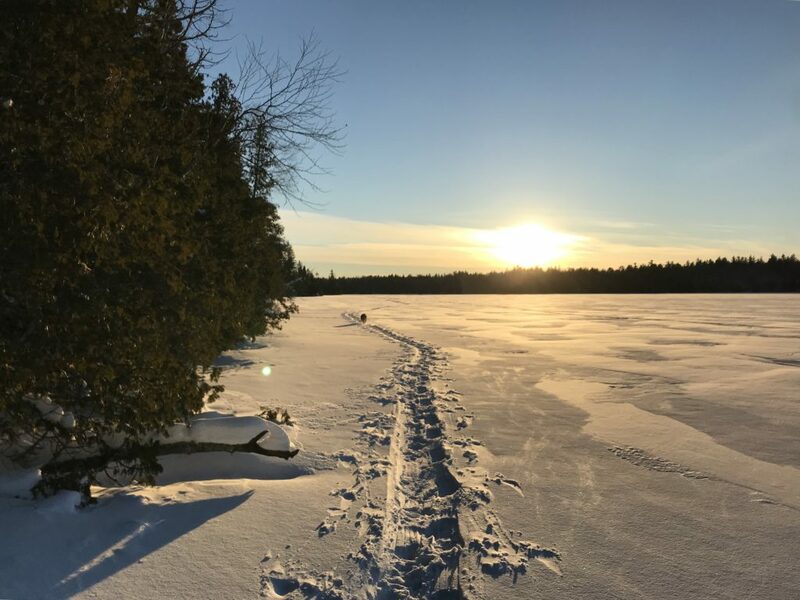 2/21/2019 – The Forest Service has just announced the date for the re-launch of the 2019 Wilderness Permit reservation system as March 4th, 2019 at 9 am CST. See the complete press release below. And as always, let us know what questions we can answer for you as you navigate the new system. Area Wilderness quota permits on Recreation.gov. 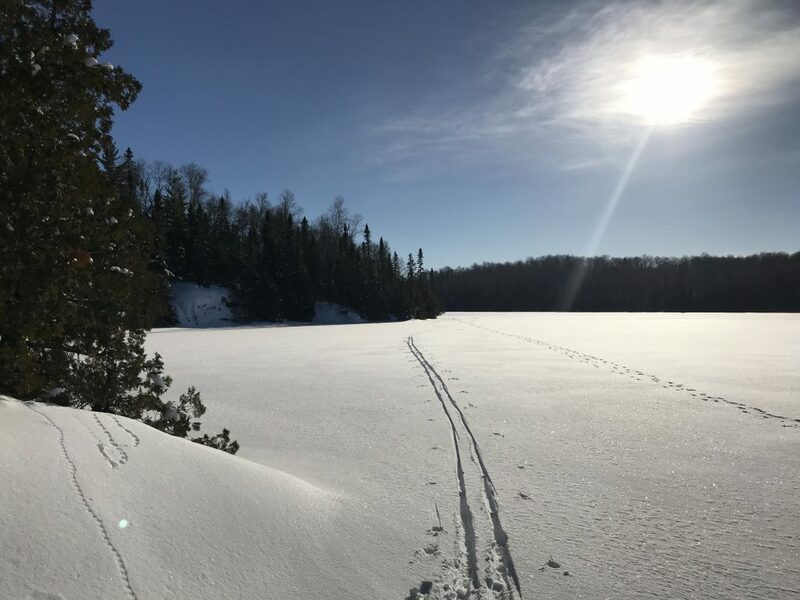 The BWCAW, located on the Superior National Forest in Minnesota, is one of over 3,500 facilities across the country which utilize Recreation.gov to manage their reservation processes. Full details on the reservation process are located at https://www.recreation.gov/permits/233396. 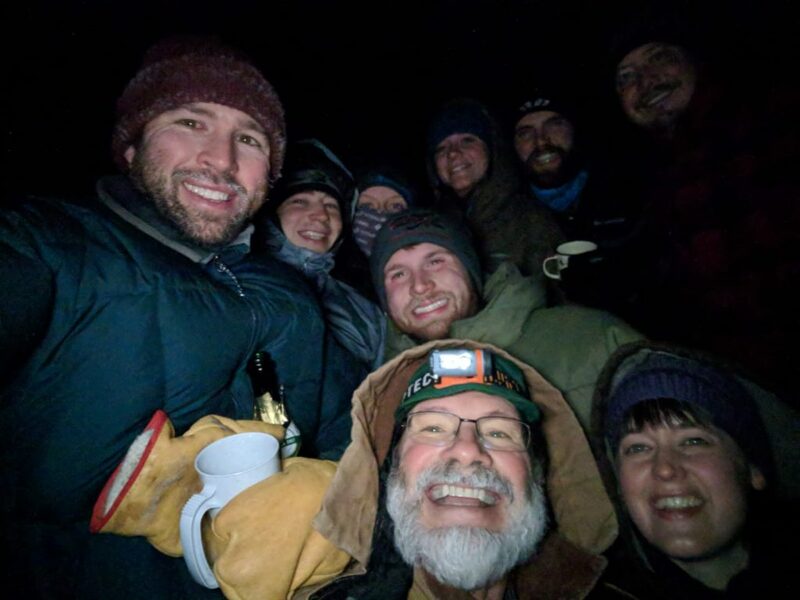 2/12/19 – The most recent update we’ve gotten from the Forest Service is that they tentatively plan to have permits available on February 27th at 9am, which coincidentally happens to be Clare Shirley’s birthday. With any luck, and some birthday magic, we’re hoping everything happens according to plan. In either case, we’ll keep this updated if we hear of any changes. Huck pondering the error in his ways. 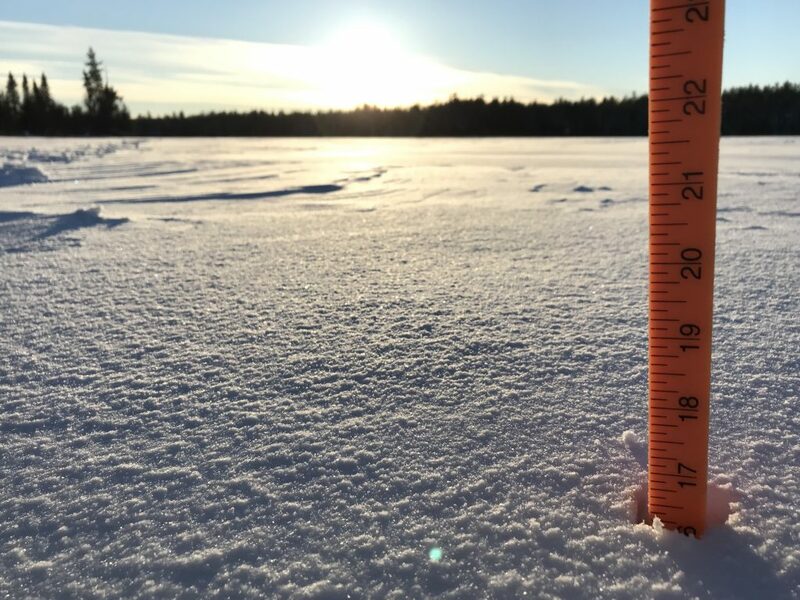 2/3/19 – Over the years, many of you have enjoyed following along with our weather records on this site. In the busy life with two small kids and learning the ropes of the business, I’ve been lax in posting the weather. I’m sorry! Rest assured, I’ve been faithfully tracking and recording all the information – just like Bill, and Frank before him. The notebook of records has been sitting in the windowsill taunting me for too long. So, I’m rededicating myself to keeping the records on this site up to date. I’ve backposted all the records and will be updating them daily from here on. Thank you for your patience! 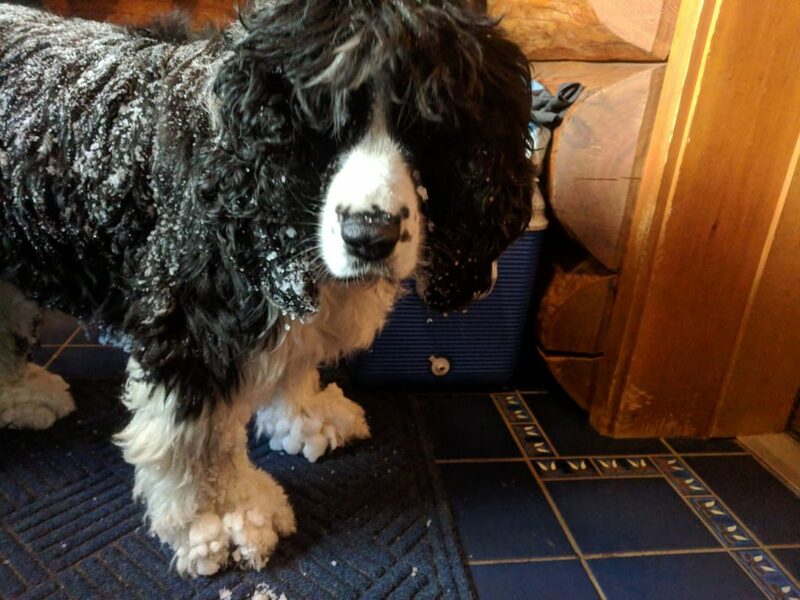 In other news, we continue to enjoy a cold and snowy winter up here at the end of the Sawbill Trail. The frequent low temps and snows have created a beautiful landscape. The cold temps have kept our adventures short and close to home, but when the Wilderness is your backyard, that’s ok! 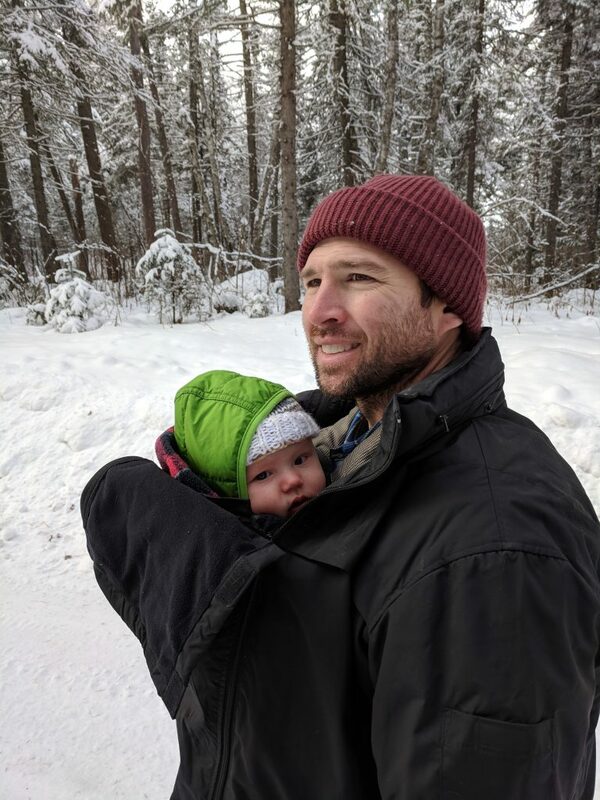 Dan and baby Sig enjoy a brisk walk. Kit explores the woods on the south shore of Sawbill Lake. 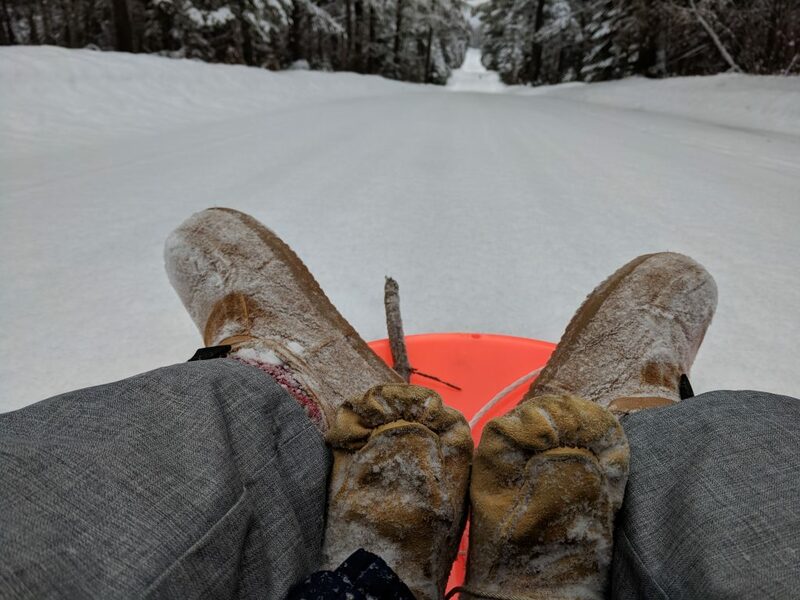 Sledding mukluks on the Sawbill Trail. Frosty trees along the shoreline of Sawbill Lake. Cheers to the real winter! 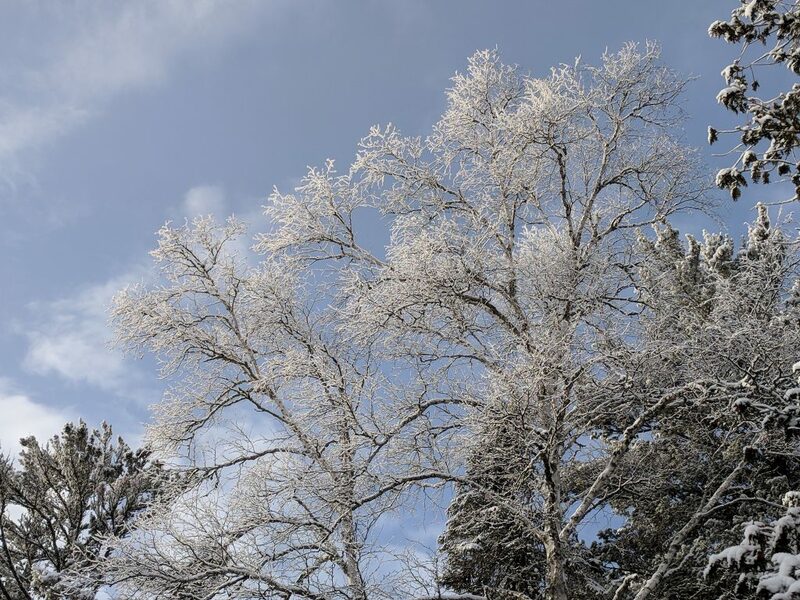 1/30/19 – PERMIT UPDATE: We have just (10:20 am) been informed by the Forest Service that due to the extent of the technical difficulties and inconsistencies in functionality of the reservation platform, all successful permit reservations are going to be voided and the system is being closed until the issues are worked out. They will offer notification when the system will go live again. If you have already reserved a permit, we recommend holding tight to see what happens, but be prepared to re-apply for your permit. We’ll update as we learn more. In the mean time, enjoy the crisp weather! 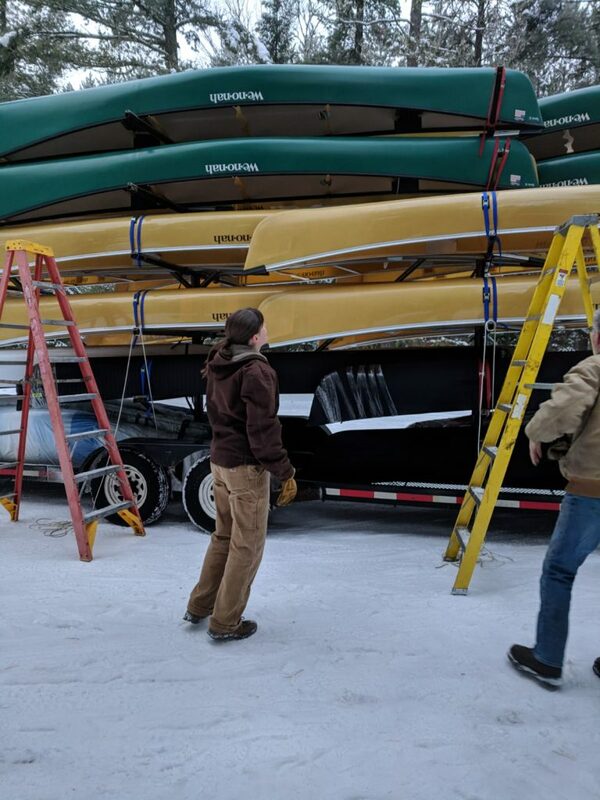 1/4/19 – Since our last post we received a delivery of 23 brand new Wenonah canoes, welcomed a solid foot of snow in one dumping, and rang in the new year with some of our favorite people on one of our favorite lakes. The delivery driver and I contemplate how the heck we’re going to lower the Spirit IIs from the top of the trailer. 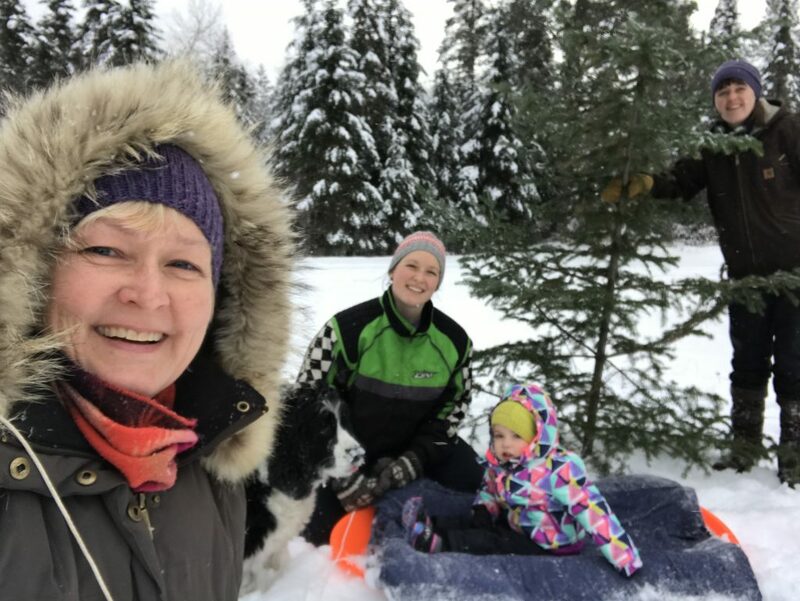 In accordance with New Years tradition, we headed down to the lake to ring in 2019. Just before midnight, temperatures dropped to a relatively balmy (compared to years past) -15 degrees, accompanied by a -30 degree wind chill. From left to right. Front row; Brian and Jessica. Back row; Dan, Owen, Katie, Kevin, Hannah, Nick, Luke. Not pictured; Claire, Clare, Kit, and Sig (all fast asleep). 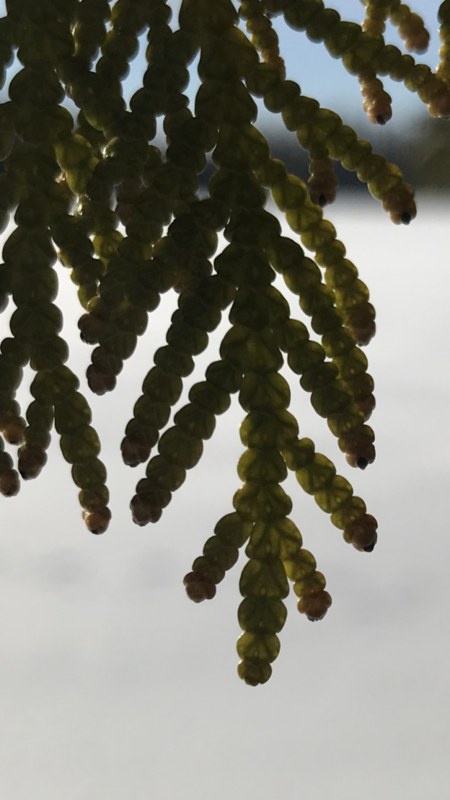 This cedar caught my eye when I stopped at a campsite to soak in the sun. Clearly it too had the same idea, although it was accomplishing the goal more efficiently than I. This picture was taken at a campsite in Kelso bay. I call it; Tracks, Tracks, Tracks. From left to right; rodent tracks, my tracks, wolf tracks. And we’re off! 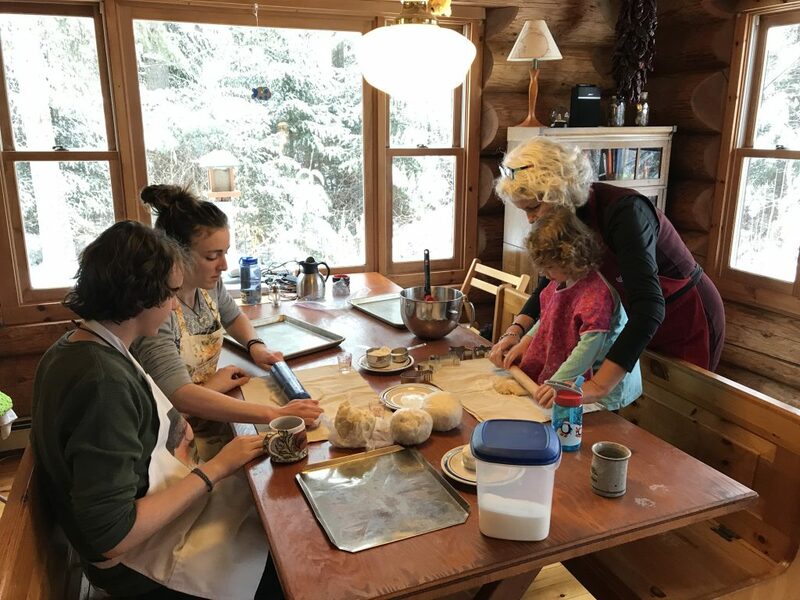 Carl and Crista start rolling out the, affectionately named, SOB cookies (they’re a lot of work), while Cindy and Kit get to work on the classic sugar cookies. 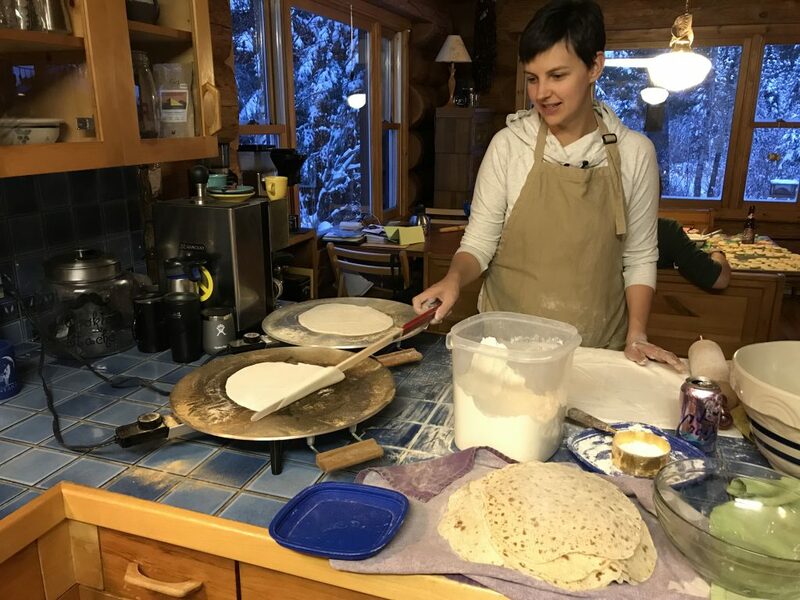 While the cookie team is at it, Clare cranks out mass quantities of lefse. 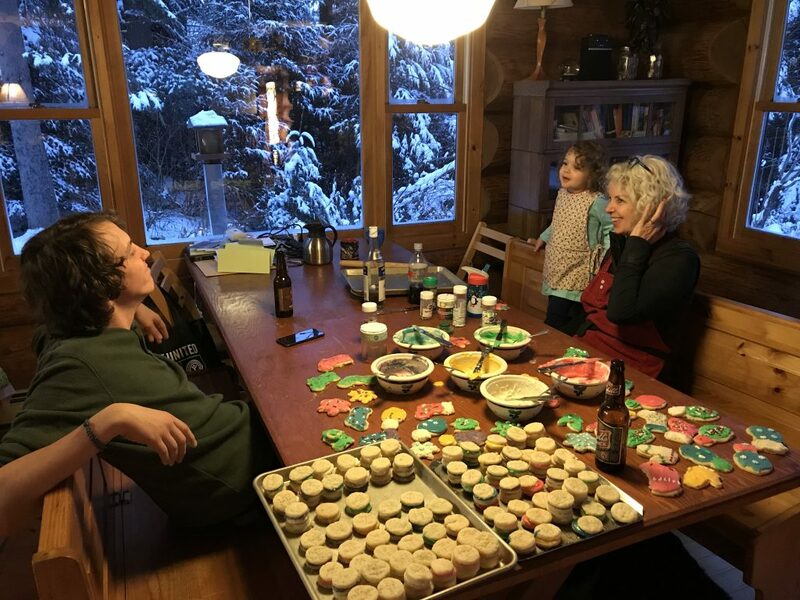 11/28/18 – I was lucky enough this past holiday weekend to have my family gather together right here at Sawbill. 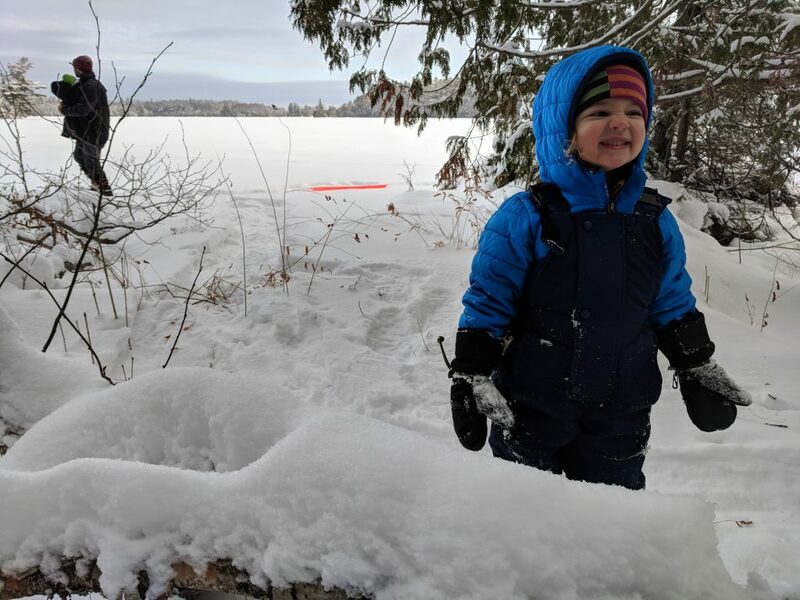 It was a ton of fun to have the group together in a setting only the snow covered northwoods can provide. Thanksgiving included the obligatory tonnage of food, card games, a million piece puzzle, lots of bird watching, and great company. 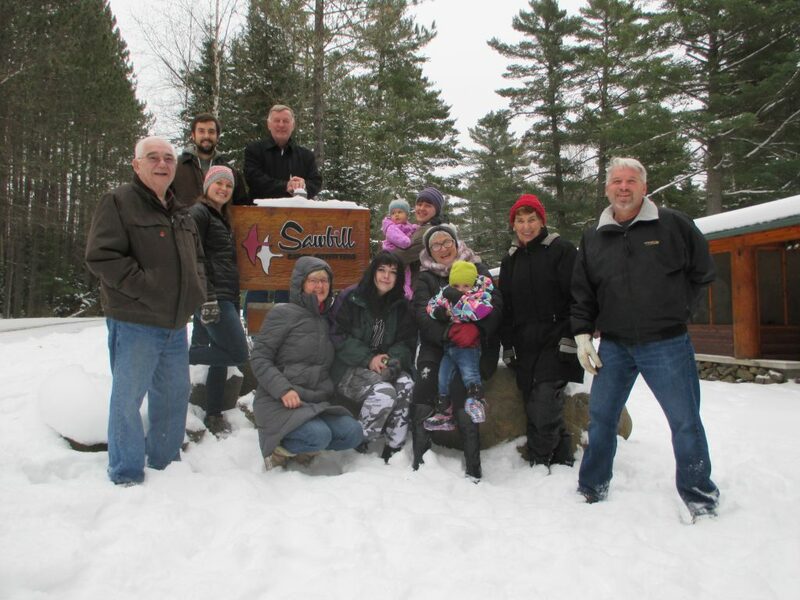 My amazing family in front of the Sawbill sign. Photo credit to my mom. As you can see she’s become quite the expert in self-timers. 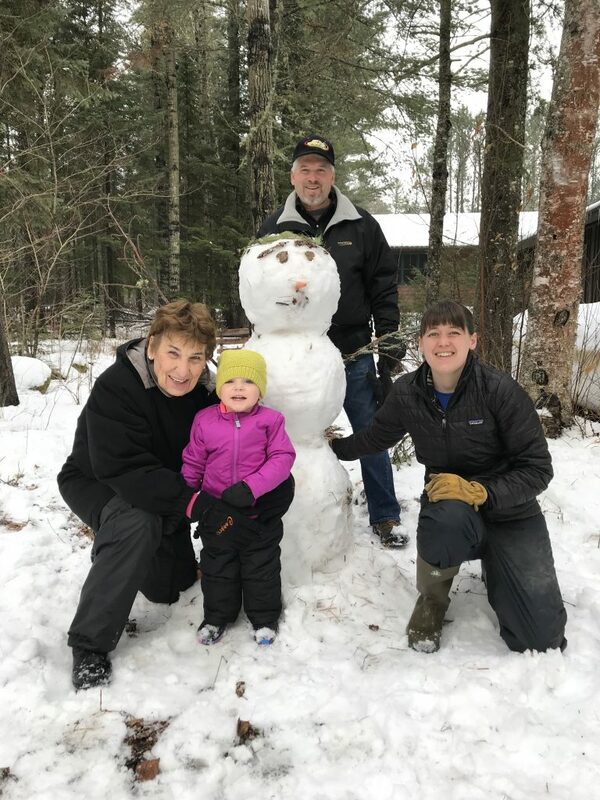 My grandma Barb pictured with three generations of snowman sculpture apprentices in tow. As you can see by this masterpiece, she is a true artist in this medium. 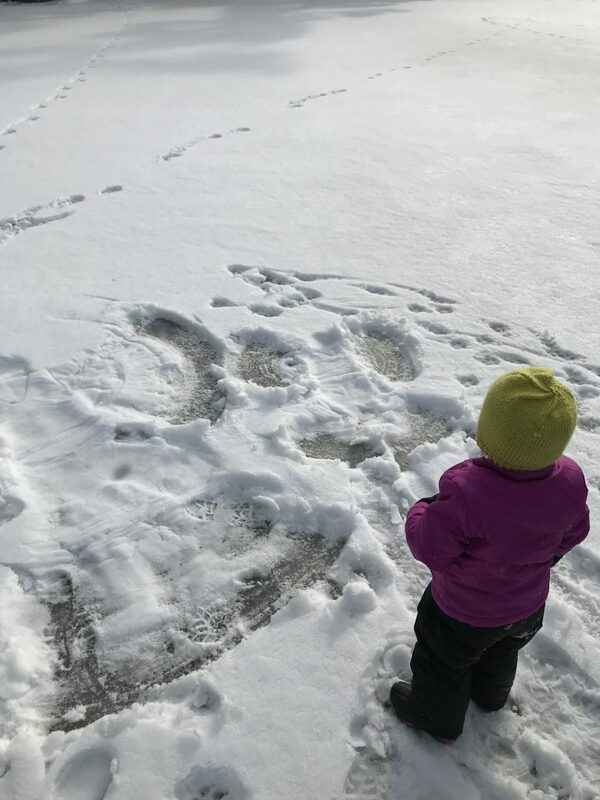 Shortly before we departed the lake a few snow angels made an appearance, but otherwise crowds were minimal. The final cap to the weekend included Christmas tree hunting. We were pleasantly surprised to find the isles remained fully stocked following a busy start to the holiday shopping season.